The Chicago based, Oak Bottle is revolutionizing the beverage and bar industry by allowing consumers to take their cheap and average tasting wine, whiskey or any other desired spirit and transforming it into an expensive, vintage tasting beverage within hours. Becoming a seasoned winemaker or experimental spirit distiller is closer than you may think with the help of the first for home-use, barrel aging apparatus known as the Oak Bottle. 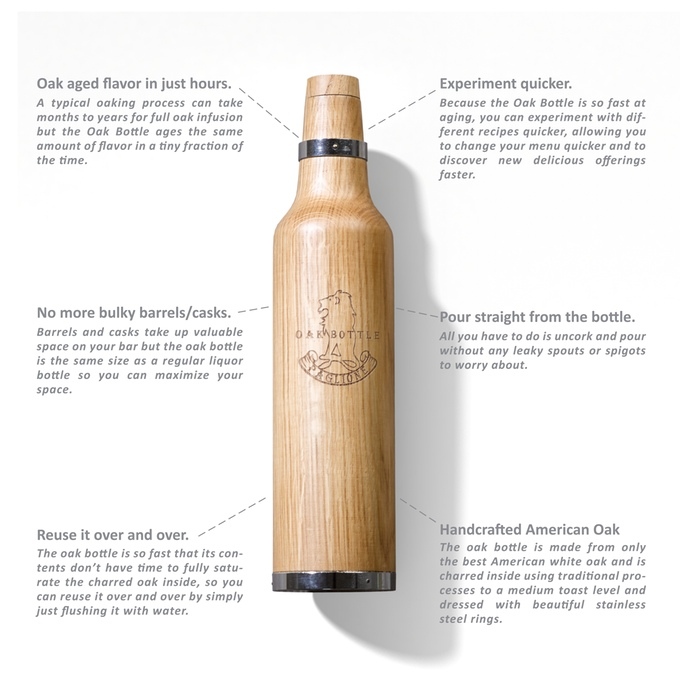 The Oak Bottle is an unprecedented bar essential that’s revolutionizing the way consumers enhance the flavor profiles of their favorite alcoholic beverages in the comfort of their own homes. With the Oak Bottle, it’s easy to transform the ordinary into something extraordinary in the span of only a few hours to a few days. Wine and spirit enthusiasts are putting it to use by taking cheap or average tasting options and elevating them to palette pleasing levels. A paltry Chardonnay, Merlot, or Cabernet can become a restaurant quality vintage, while the simple Whiskey, Brandy, or Tequila becomes something rich and sip-worthy. 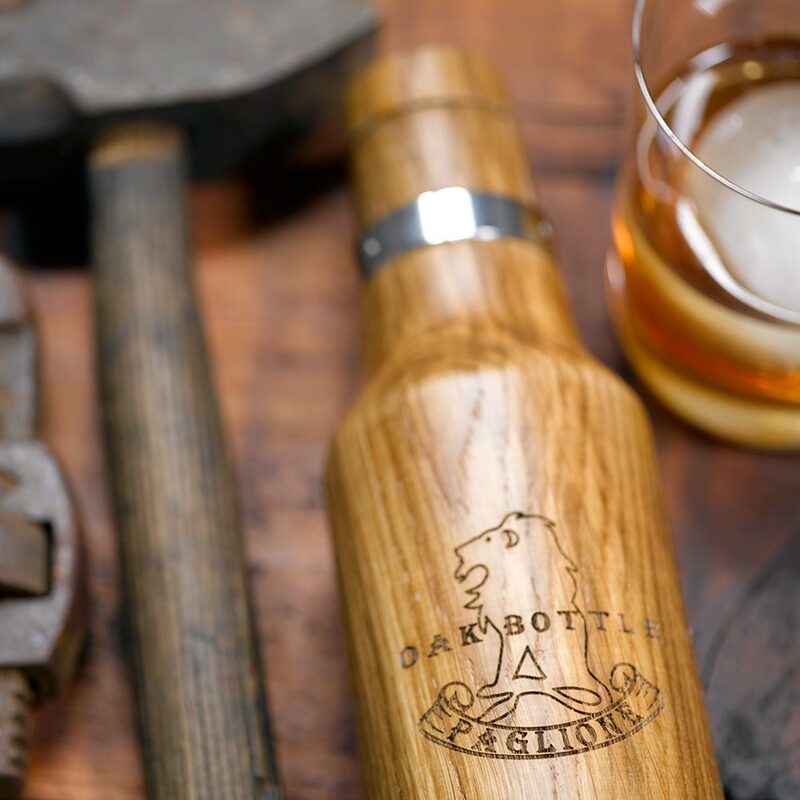 “We are embarking on a journey in a marketplace with a never been done before product that has the potential of revolutionizing the industry,” said Oak Bottle Creator Joel Paglione. Trends in aging whiskey and other spirits are on the rise, and the Oak Bottle is excited to be the first effective household tool to tackle the market. “It’s putting the power of experimentation and personalization into consumers’ hands affordably, giving them the chance to age a young spirit into one ripe with character and body in only a few days,” said Paglione. Technomic Inc., the leading food research and consulting firm, noted in a recent press release the growing popularity of signature cocktails. Barrel aged cocktails in particular are picking up steam in bars and lounges worldwide, and the Oak Bottle’s conveniently portable size, reusability, and quick turnaround time is helping to blaze the way. Recently, two of the top bartenders, James Estes and Claudiu Mnerau, won the Diageo Reserve World Class heat while utilizing the Oak Bottle. This year Oak Bottle is planning to take the brand to new heights as they prepare to launch a much anticipated Kickstarter Campaign later this month. Highlights of the upcoming launch will include the release of their recipe book, aged, which will provide enticing recipes and helpful tips on barrel aging using the Oak Bottle. Oak Bottle Creator and Chicago Resident, Joel Paglione grew up immersed in the winemaking industry through his family’s vineyard and winery. It was here he learned that the smaller the oak barrel, the quicker it was to achieve that ideal oak character. Yet, there were no cost effective, small sized options available for the home enthusiast. This revelation spurred him to develop the smallest possible oak infusion vessel ever made and the Oak Bottle was born. His invention is making its way into retailers including Brookstone, Bed Bath & Beyond, Lakeland UK and many stores in the Midwest, and can be found worldwide in the USA, Dubai, Russia, the UK, Australia, Canada, and Germany. It has even been put on display in North America’s largest wine museum next to the historic oak barrel. For more information on this innovation, go to http://oakbottle.com/.